Most Americans are comfortable fixing a date (July 4) and an event (the signing of the Declaration of Independence) to a definitive moment when the United States separated itself from its colonial parent, Great Britain. But for University of Notre Dame historian Patrick Griffin, the revolution is better understood as a process—not an event. And it was a process, he says, that was often far removed from the somber reasonableness of venerated historical moments such as the signing of the Declaration or writing of the Constitution. These rational moments of the revolution provide “one of the central ways that American culture holds itself together,” says Griffin, chair of the Department of History in Notre Dame’s College of Arts and Letters. “This is our origin myth. We still live within these myths, and we neglect the various negotiated, nasty trade-offs we needed to bring the revolution’s uncertainty and violence to an end. In his latest book America’s Revolution, published this month by Oxford University Press, Griffin offers a new interpretation of a political and military struggle most Americans think they already understand. Griffin’s highly original take on the revolution may change their minds. The American Revolution, he says, represents a process that in many ways is ongoing, still reframing America cultural and political life today. “I wrote America’s Revolution to get us out of the standard way of thinking about the revolution,” he says—the hagiography associated with the Founding Fathers and the romanticizing of a conflict that was oftentimes shockingly violent. American school children know the tales of Betsy Ross, Thomas Jefferson, and the writing of the Constitution, he says, but the nation’s revolutionary struggle was far more complicated than accounts found in most history books. 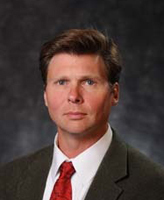 Griffin, the Madden-Hennebry Professor of History, is also author of American Leviathan: Empire, Nation, and Revolutionary Frontier (2008) and The People with No Name: Ireland’s Ulster Scots, America’s Scots Irish, and the Creation of a British Atlantic World (2001). He describes the revolution as an historical touchstone that is affectionately revisited through different historical epochs and moments of crisis. But a more accurate narrative captures its acute social stress and civil breakdown. “The British notion of sovereignty was collapsing, and Americans were competing with each other and the British to reconstitute a new understanding of sovereignty,” Griffin says. 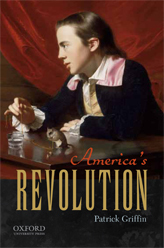 America’s Revolution looks at “dynamic relationship between the founders and the so-called common people” of the era as they cobbled together a new society through the experience of the revolution. The worst violence of the war, Griffin says, occurred in areas of the colonies where communities were more or less evenly divided in support of the British Empire or the emerging colonial confederation. As a result, the revolution took the form of regional mini-civil wars and included the same kind of brutality associated with such fratricidal struggles. “Different sets of interests were competing and fighting with each other in a world where there was no longer any sovereign authority, and when there is no sovereign the lid comes off and the furies are released,” he says. “Some areas of the colonies really collapsed into unspeakable violence: the American West and North and South Carolina; New Jersey is also a place that became extraordinarily bloody. Originally published by Kevin Clarke at al.nd.edu on August 16, 2012.